To create or to compete. Many companies mistake one for the other. When a company creates, it implies it has found new products/services or new methods of buying/selling. These new products or methods are hard for the competition to attempt. When one competes, a company targets the same markets and consumers as the competition does and most likely, with the same methods, the competing companies use. Following competition, learning, and adapting from them is another thing. 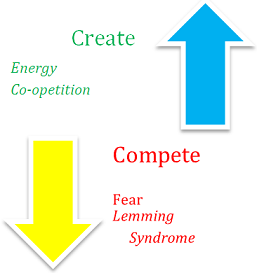 However, blindly following the competition and copying their every move leads to decreasing margins as the company suffers from the ‘lemming syndrome’. In fact, companies can make the competition work for them instead of being fearful that they will take away the business. Coke was the first cola company in the market and that brand heritage, taste and history has been its success. Dominos was the first to home deliver pizzas and has been successful since then. FedEx was the first to introduce overnight express delivery and has been successful globally. In the 1980s, Pepsi was quickly catching up with Coca-Cola and winning new customers. Pepsi and even Coke’s own brands like Fanta, Sprite and Diet Coke were challenging its number one status. Coke narrowed down the problem to taste as Diet Coke was doing well in third position and was similar in taste to rival Pepsi. In 1985, after extensive market research tests, Coke launched the New Coke with a new formula and taste (more like Pepsi). It even stopped the production of the original Coke. Consumers were not very happy and the move backfired. Coke had underestimated its brand power and the heritage its brand stood for. Coke had to reinstate the classic Coke and learnt a valuable lesson of consumer perception of its brand rather than a mere competition of products. In 2009, PepsiCo acquired its bottlers. This gave it more control over distribution and product placement at retailers. PepsiCo was very successful. However, the following year, Coca-Cola copied the move with its bottlers in North America and gained back the advantage. Sometimes a company can create but is still unsuccessful. E.g., Sony’s Betamax video recorders failed in spite of better quality Betamax technology over VHS (video home system) format. Sony’s inability to license the technology and widespread use of the VHS format contributed to the downfall. Currently creation is the need of the hour but perhaps herd mentality of competing is winning with risks getting riskier.